Squeaky Books: Some things are just WRONG! Now I usually stay out of controversial issues. I didn't participate in Banned Books Month/Week, I didn't talk about the "Speak Loudly" issue, but I can't stay quiet about this, because it is just WRONG! Are you familiar with James Frey? He wrote A Million Tiny Pieces, which is a memoir about addiction. The book was HUGELY popular. Frey even appeared on Oprah. Then guess what we found out? Most of the book was made up. Now, Frey has developed something called a Fiction Factory. In which he hires authors to WRITE BOOKS FOR HIM. And his genre of choice? Young Adult. Nicole led me to this all-tell article. I'm so upset I don't yet have the self-control to properly articulate my feelings on this issue, so this next portion of this post will be my annotations and emotions I went through while reading this article. Hopefully, rather than forcing my own opinion on you, this form of rant will help you develop your own opinion. Enjoy, if you can. HIRING?! Hiring writers?! EDIT: As was rightly pointed out to me in the comments. Hiring writers in itself is not wrong. But if you read on, you will see it is very wrong in this case. We were desperate to be published, any way we could. We were spending $45,000 on tuition, some of us without financial aid, and many taking out loans that were lining us up to graduate six figures in debt. A deal like the one Frey was offering could potentially pay off our loans and provide an income for the next decade. Do a little commercial work under a pseudonym, sell the movie rights, and never have to suffer as a writer in New York. We wouldn’t even need day jobs. These are students talking. People, if you are being forced to write under a pseudonym, that means you don't get any credit! Frey handed him a one-page write-up of the concept, and Hughes developed the rest of the outlined narrative. He just handed him a one-page write up?! And suddenly he's writing books? Dang. I wish that worked. I have about fifty-million one-page books. The whole point of writing is writing! Not just thinking up a story. Frey’s idea was a series called “The Lorien Legacies,” about nine Loric aliens who were chased from their home planet by evil Mogadorians and are living on Earth in the guise of teenagers. WHAT?! I Am Number Four is a result of this fiction factory? I really liked that book. But I wish I could like it for the right reasons. 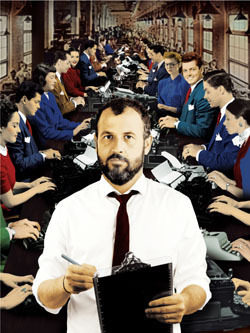 In exchange for delivering a finished book within a set number of months, the writer would receive $250 (some contracts allowed for another $250 upon completion), along with a percentage of all revenue generated by the project, including television, film, and merchandise rights—30 percent if the idea was originally Frey’s, 40 percent if it was originally the writer’s. The writer would be financially responsible for any legal action brought against the book but would not own its copyright. So basically, you get all the crappy stuff, and they get all the good stuff. Frey and Almon told me they would send me a contract but warned me that I shouldn’t bother trying to negotiate. They weren’t acceding to other writers’ requests and wouldn’t accede to mine. AKA We are the boss of you, mindless slaves! No matter which way you look at this, it is WRONG. He is taking YA literature and turning it into mass-produced and commercialized sweatshop material. Writers! There are other ways to help your book get published, you don't need to sell your writing soul. If it's your book, you deserve the credit both good and bad. YA author John Green has spoken about this—the more Twilights there are and the more books purchased at Wal Mart, the fewer unique titles actually get produced. While I am not actively writing now, I do hope to someday write a YA novel and attempt publication. How can this be possible if we're being swarmed by these massed produced commercialized books?! The worst part for me is that these books are good. I really enjoyed I Am Number Four but why can't we just give the actual author credit? And changing a book just so you can produce toys? I just... I'm speechless. Once again, I don't usually comment on these sorts of issues. I apologize if I've offended anyone, but I just can't abide this. If you don't think this is wrong, PLEASE contact me. I'd love to see how this could be justified, because I just can't fathom it. If you'd like to read the full article, you can click here. However, be forewarned, Frey has a bit of a potty-mouth. I hate being angry. I just want to curl up under a rock. Wow... That's like, ridiculous! I can't imagine agreeing to write like that! Sad day. Sad, sad day. I avoided I Am Number Four because I'd heard it was written by Frey under a pseudonym and I wanted nothing to do with his lies. One of the comments about it that really turned me off was that it seemed to be written for the screen in mind, with lots of action and explosions and stuff that would make a good movie. I guess we know now why that is. He was aiming for commerciality. People will find a way to commercialize anything. I just wish that it didn't eclipse the works of art that real writers are struggling to produce. And this just seems like... well, an insult to other writers. James Frey is obviously not a real writer, and his actions prove that he was never really interested in writing. He just wanted fame and money. And that's very sad. Just a note - "hiring writers" is the first thing you freaked about. It's common, and there's nothing inherently wrong with that. I am a writer, I've written for hire. I translate video games, so I've worked in situations where I get my name on it, and situations where I don't. I've done work-for-hire writing strategy guides. I've been there, and usually it pays quite well. You can hire a writer, book packagers will do this to write a series (Nancy Drew, Sweet Valley High, Hardy Boys, Gossip Girl), but these people are usually paid much more. Hiring writers does not automatically equal evil. That said, this is not one of those situations. This is one writer screwing over everyone for the sake of his own ego, and I don't like that one bit. Basically my point is that hiring writers is not automatically bad. It's the rest of the terms that makes James Frey an a-hole. eeeschen is right. There is nothing wrong with hiring writers. There was not one Nancy Drew...there were many more writing under that name. Same thing with the Warrior series - there are 4 Erin Hunters. However, Frey is a bully. He has influenced college students (and others) to think that they aren't capable of being successful on their own. He then offers them a deal that is no deal at all. It's easy to say that they are selling their soul to the devil. So very sad. Ironically enough, I Am Number Four is sitting right next to me. I had no idea Frey was behind it. It is a library book so I will read it (maybe), but I will go in with a more critical eye than before. So happy I didn't buy. Thx for the article and post! you are right, of course. My mother has been a hired writer countless times. I should have specified that my disgust was in this particular case. There's nothing wrong with just "hiring" writers, but exploiting them like he does is wrong. I also wanted to read I Am Number Four, but I had been putting off getting it because i wasn't exactly my genre of choice. Now I don't want to have anything to do with it. I agree that Frey is a bully and I don't like bullies, and I'm not about to buy his book and help him perpetrate his bulling. Sorry author of it, but that's it. I have nothing against book packagers, honestly, some truly fun books have come from them; just as I think there is nothing wrong with writing for hire. So long as you do it with your eyes wide open, knowing what you're getting into. Yes, the legal end of a contract is hard to understand - just try to read the user agreements on any software you download - but certain things are just common sense: don't sign what you don't fully understand, and don't sign if they are taking all the good stuff and leaving your the crappy stuff (By what stretch of the imagination is that a good deal?). I wonder if there is anyway we (as a reading community) can keep track of Frey factory books. It's a real shame for the actual writers behind his books but I for one won't be reading any of them if I can help it. Ghost writing isn't inherently a bad thing. That's how a lot of writers make their living. And writing under a pseudonym doesn't mean they won't get credit. It just means its pseudonymously written. Whether it's the former or latter, we'll end up knowing who wrote it. So basically Frey is that guy with the ideas what walks up to a writer and goes, "dude, I have all these ideas that I think you should write" and them mooches all of the credit. Usually we pimp smack those guys. What he's doing is making a mockery out of publishing in general, especially that of YA. The thing is, those books will fail eventually. Writing is one thing that can't be mass produced. People will see the difference between the good stuff and the manufactured stuff. They already see it now. He'll only be able to float so long on something like this. And why is Frey being fed to do this? People wanted to flay him with a million little pieces and now he's taking advantage of the situation. Maybe that's why he's going YA; hoping the young ones won't remember his Oprah issue. So I think that in general, a "fiction factory" is just another way to get a book published, and it kind of makes me think of Alloy Entertainment, which is a book-packaging firm. However, I think that in this case, there is something wrong with it. For one thing, James Frey is a noted liar. (You know, there's nothing wrong with writing a novel. You don't have to write memoirs.) That means that I don't think that he can be trusted. For another thing, it doesn't seem like it's about getting new books out into the market. It's about Frey making money for coming up with high-concept ideas that are supposed to be made into movies. It's not about the book any more. This just seems like a disaster waiting to happen, something that desperate young writers will agree to without truly knowing the consequences, although I do believe that you could use the idea of a "fiction factory" and actually create something that's really good. My first reaction is the desire to burn my copy, no, really! But here is the catch, Enna, we both liked that book and some anonymous schlep out there did a fine job turning one page into a book. I'm thinking I will just appreciate the book for what they were intended to be, and that is action movies. I won't buy another book, but I will enjoy the movies. At first I was kinda like wow that's really bad, but as I sit and think about it...what's really so horrible about it? Take someone else, not a loser, and would it really be such a terrible way for unknown authors to get their books published? VC Andrews has been dead for 25 years, but books under her name are still published. Clive Cussler, James Patterson and soon Janet Evanovich have "co-authors", but if you read those books you can tell it's the other person that wrote that book and the famous one just added their name to it. This guy wasn't the first guy to commercialize bookselling. He's just using a different business model to do it. Those authors, just like his, sign a contract and they do get paid. The guy is a sleaze, but he's getting product out...product that we like. You can still read it, from the library or other borrowing service, without putting any money is his pocket. You're right, it would be perfectly fine, if he wasn't exploiting these authors' talents. If anyone were to read the "fine print" you'd see that this is not a deal you'd want to get yourself tangled up in. I just read all of "James Frey's Fiction Factory" and found it completely fascinating. Here's what I think it comes down to: The writers who signed with him should have had their contracts checked out by a lawyer, or some other knowledgable source. That's just basic business sense. I Am Number Four was a great read. I actually just wrote a post about it :) I am definitely looking forward to book #2 of the Lorien Legacies, regardless of who the author is! a lat tower, and many of the other gains from the other two.